and such other items as may be specified, by notification, shall be excluded. (ii) of clause (a) of sub-section (1) of this section. (d) one representative each of the associations of micro, small and medium enterprises, members, ex officio. (3) The Member-Secretary of the Board shall also be the ex officio Member-Secretary of the Advisory Committee. sub-section (1), obtain the recommendations of the Advisory Committee. any subject referred to in section 5 and furnish its recommendations to the Board. specified in section 9, 10, 11, 12 or 14 of Chapter IV. (e) the international standards for classification of small and medium enterprises. Commission Act, 1956 (61 of 1956),the Central Government may, while classifying any class or classes of enterprises under sub-section (1), vary, from time to time, the criterion of investment and also consider criteria or standards in respect of employment or turnover of the enterprises and include in such classification the micro or tiny enterprises or the village enterprises, as part of small enterprises. There is no definition provide in CGST Act of Immovable Property. In general terms an immovable property is an immovable object, a property that cannot be moved without destroying or altering it. It is fixed to the earth, such as a piece of land or a house. Immovable property includes premises, property rights (for example, inheritable building right), houses, land and associated goods, and chattels if they are located on, or below, or have a fixed address. 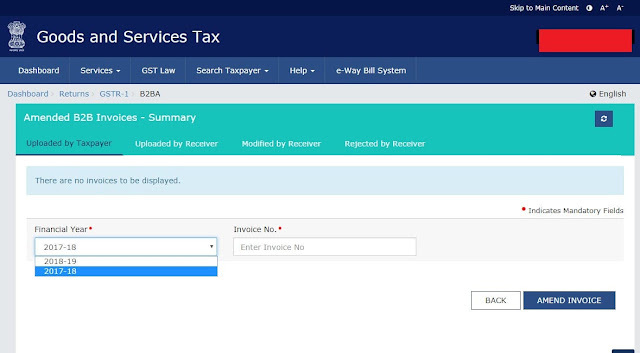 GST is now applicable in place of service. The type of GST to be charged will depend if the supply is intra-state or inter-state. This will be ascertained by determining the place of supply of the service. Location at which the immovable property. If the immovable property (or boat/vessel) is located in more than one State then all the states will be considered as place of supplies in proportion in value of services. The states will share GST in proportion to the value of services. Place of supply of services provided in relation to an immovable property is the location of the immovable property which means GST will be CGST and SGST. CGST and SGST credit of one state cannot be used to set-off the liability of another state. GSTR-4 is a GST Return that has to be filed by a Composition Dealer. Unlike a normal taxpayer who needs to furnish 3 monthly returns, a dealer opting for the composition scheme is required to furnish only 1 return which is GSTR-4. GSTR 4 has to be filed on a quarterly basis. The due date for filing GSTR 4 is 18th of the month after the end of the quarter. Debit / Credit Note in respect of above mention supplies. In this article we elaborate each section of GSTR-04 and the details to be provided in it. The taxpayer’s GSTIN will be auto-populated at the time of return filing. The taxpayer’s name will also be auto-populated at the time of logging into the common GST Portal. 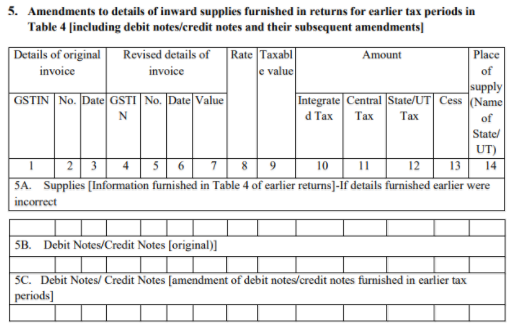 In this section, the taxpayer has to furnish details of the previous year’s aggregate turnover, and the aggregate turnover for the period of April-June, 2017 (for the first GSTR-4 return). Furnish the details of inward supplies from a registered supplier whether inter-state or intra-state (ie within state) on which reverse charge is applicable. 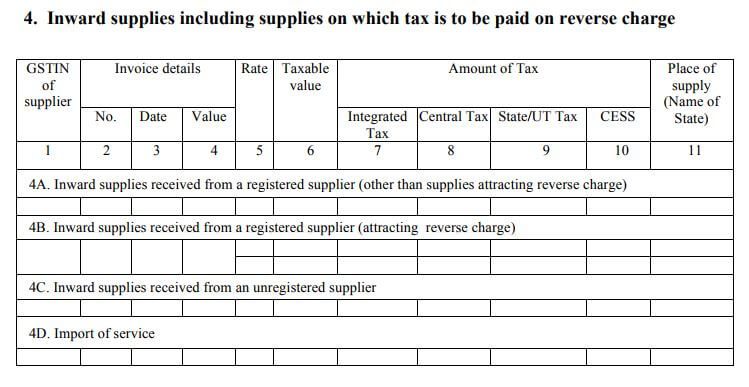 Tax payable amount on inward supplies against reverse charge will be calculated based on these details. Tax paid under this head will form part of cost of inward supplies. No ITC availbe on tax paid under this head to composition dealer. Enter the details of inward supplies from an unregistered supplier whether interstate or intrastate. RCM on purchase from unregistered dealers has been put on hold from 13th Oct 2017. Hence RCM on purchase from unregistered dealers is still applicable up to 13th October 2017. Import of services on which tax is to be paid due to applicability of reverse charge. Only IGST and Cess will be applicable and to be paid. GSTR-4 cannot be revised after filing on the GSTN Portal. Any mistake in the return can be revised in the next Quarter's return only. It means that, if a mistake is made in the GSTR-4 filed for the July-September quarter, the rectification for the same can be made only when filing the next quarter’s GSTR-4. Credit / Debit Note against supplies attracting reverse charge is to be mentioned here. Taxes under reverse charge will be payable net off original supplies and Credit / Debit Note. Enter the net turnover and select the applicable rate of tax, tax amount will be auto- computed. Net Turnover = Value of taxable supplies (as reflected in original invoices) + advances received – goods returned +/- Debit Notes/ Credit Notes (as the case may be). IGST and Cess is not applicable since a composition dealer is not eligible to make interstate supplies. Any change to be made to details of sales provided in previous returns is required to be stated here along with original details. 8A. Advance Amount paid for reverse charge supplies in the tax period. In case the invoices have already been received against these advance payment, such payments must be excluded. 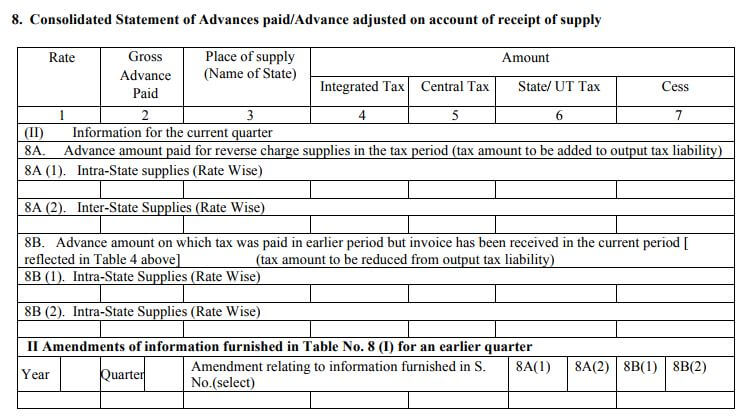 Any TDS deducted by the supplier while making payment to the composition dealer has to be entered in this table. GSTIN of the deductor, Gross Invoice value and the TDS amount should be mentioned here. Total tax liability and the tax paid have to be specified in this table. IGST, CGST, SGST/UTGST and Cess have to be separately mentioned here. Interest and late fees payable for late filing or late payment of GST have to be mentioned here. The interest or late fees payable and the payment actually made should also be stated in this table. Any refund of excess taxes paid can be claimed here. The refund has to be further segregated into tax, interest, penalty, fees, and others. All GST payments made in cash reflect here. The payments have to be further segregated into tax paid through cash, interest paid and late fees paid. 1). For the registered persons (Regular) who failed to furnish the details of outward supplies in FORM GSTR-1 for the months/quarters from July, 2017 to September, 2018 by the due date but furnishes the said details in FORM GSTR-1 between the period from 22nd December, 2018 to 31st March, 2019 wide Notification no 75/2018-Central Tax ,dt. 31-12-2018. 2). For the registered persons (Regular) who failed to furnish the return in FORM GSTR-3B for the months of July, 2017 to September, 2018 by the due date but furnishes the said return between the period from 22nd December, 2018 to 31st March, 2019 wide Notification no 76/2018-Central Tax ,dt. 31-12-2018. 3). For the registered person ( composite dealers) who failed to furnish the return in FORM GSTR-4 for the quarters from July, 2017 to September, 2018 by the due date but furnishes the said return between the period from 22nd December, 2018 to 31st March, 2019 wide Notification no 77/2018-Central Tax ,dt. 31-12-2018. 4). For the registered person who failed to furnish the return in FORM ITC-04 for the Period from July, 2017 to September, 2018 by the due date but furnishes the said return between the period from 22nd December, 2018 to 31st March, 2019 wide Notification no 77/2018-Central Tax ,dt. 31-12-2018. The taxpayers who have already paid their late fees will not get refund of such late fees; because the notification has clearly mentioned that waiver shall be for those persons who will file their returns between 22nd December, 2018 to 31st March 2019. for the above mention period. With effect from the 1st of April, 2019 there would be two threshold Limits for exemption from Registration and Payment of GST for the suppliers of Goods i.e. Rs 40 lakhs and Rs 20 lakhs. In other words the threshold limit for GST registration has been raised from Rs. 20 lakhs to Rs. 40 lakhs. The States now have the power to decide between Rs. 20 lakhs and Rs. 40 lakhs as the GST exemption limit for the supply of Goods, within a week’s time. The Threshold for Registration for Service Providers would continue to be Rs 20 lakhs and in case of Special Category States at Rs 10 lakhs. With effect from the 1st of April, 2019 the limit of Annual Turnover in the preceding financial year for availing Composition Scheme for Goods shall be increased from 1 crore to Rs 1.5 crore. The special category state would have to decide the composition limit in their respective states within one week whether to accept the new amendment or not. With effect from the 1st of April, 2019 A Composition Scheme shall be made available for Suppliers of Services (or Mixed Suppliers) with a Tax Rate of 6% (3% CGST +3% SGST) having an Annual Turnover in the preceding Financial Year up to Rs 50 lakhs. The said Scheme Shall is applicable to both Service Providers as well as Suppliers of Goods and Services, who are not eligible for the presently available Composition Scheme for Goods. The compliance under Composition Scheme shall be simplified as now they would need to file one Annual Return but Payment of Taxes would remain Quarterly (along with a simple declaration). The Cess shall be levied @ 1% on the intra state supply of goods and services within the state of Kerala for a period not exceeding 2 years. Composition Scheme to Boost the Residential Segment of the Real Estate Sector. ii. A Group of Ministers shall be constituted to examine the GST Rate Structure on Lotteries. In GST Law two type of category of reverse charge scenarios provided. The first category is defined under section 9 (3) of the CGST/ SGST (UTGST) Act and section 5 (3) of the IGST Act. The First category is dependent on the nature of supply /supplier.